Jamie started as an intern at the Centre for Research Collections last week, here he tells us about his first few days. I have just finished my first of eight weeks as a Marketing and Outreach Intern with the CRC, and what a week it has been. After a quick induction the first week has been filled with a mixture of meeting all of the fascinating people working in the department as well as gathering and researching ideas for some of the projects I am going to be working on. Since I have started, my mind has been blown at least once a day by the interesting things that everyone is working on, and the more this happens the more eager I have been to make my internship successful so we can share some of the stories I have heard with everyone else! Well, it started with all the news surrounding the D-Day Anniversary, I started asking around to see if anyone had information about a collection relating to this that we could post to our Facebook and Twitter pages. I was directed to a photo album in the collection showing pictures and postcards of the city of Caen in Normandy. 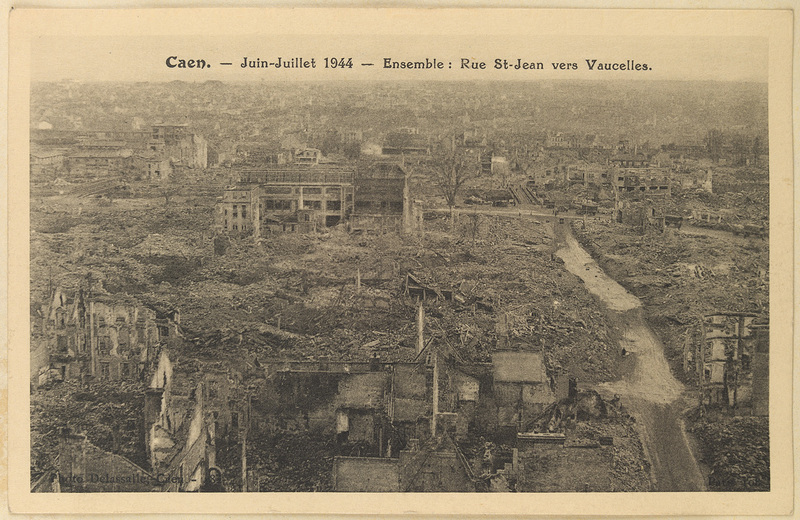 The city of Caen was first attacked on D-Day by the allies, but initial assaults were unsuccessful and the battle for Caen ended up waging on for most of June and July. During this battle Caen suffered from heavy bombing and destruction of a lot of its buildings. 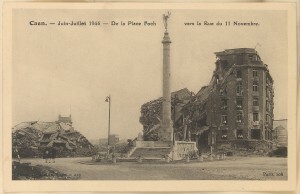 The photo album I looked through was mostly before and after pictures and it was sad to see many beautiful buildings on postcards and then next to it a photo of the same spot but with nothing more than a pile of rubble. 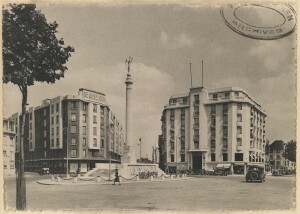 The album had been presented by a Professor John Orr, who was a professor of French here. In the catalogue book there was another entry that was a collection of telegrams and newspaper clippings from John Orr, so I decided look for more information behind the Professor’s link with Caen. Going through this collection I found out that Professor Orr was the Chairman of the Edinburgh-Caen Fellowship, and worked hard on getting the people of Edinburgh to donate food, money and emergency items to Caen following the destruction of their homes. I could go into a lot more detail on what I found out about the Professor and Caen but I think that I’ve given enough for a taster. If you want to find out more you could pop to the Centre for Research Collections’ Reading Room in the Main Library and take out the album yourself and read all about these important events in our history. Thank you for reading, and thank you to DIU for supplying the images. This entry was posted in Collections, Interns, Library on June 9, 2014 by universitycollectionsvolunteers.